Alberta's school boards have just under two months left before being required by the province to submit policies for LGBTQ students. The Edmonton Catholic School District (ECSD) has received an avalanche of bad press over the past year, and deservedly so. Trustees have attempted to implement policies that would allow "just" discrimination -- whatever that means -- and, just a few weeks ago, the board sent out a "homophobic" letter to parents from a Calgary bishop. Now, one Edmonton teenager is dealing first-hand with the results of allowing homophobia to permeate an entire school district. St. Joseph High School student Dylan Chevalier is preparing to file a complaint with the Alberta Teachers' Association (ATA) after a string of events that have made him consider leaving the school he loves so much. The 16-year-old vice-president of the students' union asked for permission from three staff members to wear a rainbow flag as a cape while participating in a school event on Feb. 4 -- a procession that would mark the opening of an annual basketball tournament in the district. 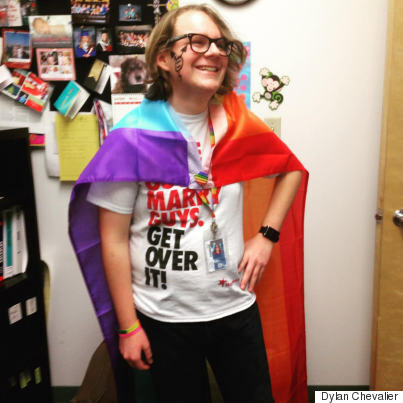 Dylan Chevalier, 16, shows off his LGBTQ pride cape. Chevalier said all of the teachers gave him the go-ahead, and, why wouldn't they -- there's nothing banning flags or capes in the school's dress code. The morning of the event, less than 20 minutes after donning the cape, a teacher pulled Chevalier aside to let him know the school's principal wanted him to remove the cape. The teacher told Chevalier, "This is not the message the school wants to send." "I was very angry," Chevalier said. "This is absolutely discrimination." "I wasn't allowed to wear my pride cape, yet there was someone dressed as Spiderman," he said, before noting the school provided no other explanation. "... when I wear it, it's to show those people, to show all LGBTQ people that you are welcome, you are accepted for who you are. Principal Hugh MacDonald told The Edmonton Journal that Chevalier was "aggressive" and "single-minded." Chevalier said he hasn't spoken to MacDonald, but when he does, he's simply hoping for an apology for his "extremely hurtful" words. "I know I'm not an aggressive person. I can be assertive, and I am probably the complete opposite of single-minded because I try to make sure I think of everybody when I do things," said Chevalier. "Me wearing the pride cape was not just for me... when I wear it, it's to show those people, to show all LGBTQ people that you are welcome, you are accepted for who you are." MacDonald told the Journal the cape was inappropriate because the procession was a formal event, something that seems to be contradicted by the fact that another student was allowed to participate in costume. The principal's comments also seem to be at odds with the ATA's Code of Professional Conduct, which, ironically, MacDonald actually outlined in an October letter he wrote to the same paper. In the letter, MacDonald argues the media's coverage of how LGBTQ children have been treated in Edmonton Catholic schools is "rich in sensationalism." He then lists the points of the code, which state that educators cannot divulge information about a pupil received in the course of their professional duties. The code also states that teachers need to respect the dignity and rights of their students, without prejudice as to their "gender, sexual orientation and gender identity." In his letter, MacDonald lists the teachers' association's code of conduct as if the rules' existence is somehow proof they can't be broken, say, by a principal who doesn't feel a rainbow flag sends the right "message" at a school event. It doesn't seem "sensationalist" to recognize that there's a clear, double-standard in how Chevalier was treated. "It's not just one student in Edmonton's Catholic schools who's being discriminated against. It's not just a single case. It's systemic." Even though Chevalier is looking into filing a complaint regarding MacDonald's possible breach of the ATA's code, he also wants people to know that he loves St. Joseph's, and in no way blames the school staff or students for the principal's words. Chevalier's real concern is with both MacDonald's behaviour and the ECSD. "It's not just one student in Edmonton's Catholic schools who's being discriminated against. It's not just a single case," said Chevalier. He's not wrong. And, if Alberta Education isn't willing to step in and ensure that its guidelines are enforced, it's only going to get worse. Alberta Education Minister David Eggen has said he would consider dissolving the Edmonton Catholic School District's board if the members aren't willing to comply with regulations and treat LGBTQ students with respect. If, come March 31, the school board turns in a document that leaves any room for behaviour like that of St. Joseph's principal, hopefully Eggen will follow through on his word. Students like Chevalier are counting on him.